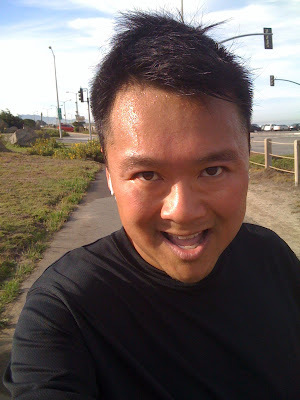 This was my final run before next week's half marathon. 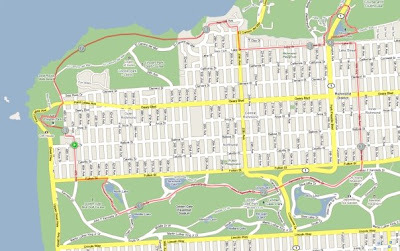 I ran 8.25 miles @ 11:30 through Golden Gate Park, up 10th, into Mountain Lake Park, through Sea Cliff, and along the trails of Lands End. I will now taper off and carb up. 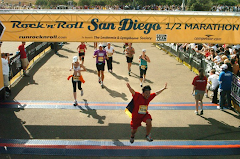 Seven days until the San Jose Rock & Roll Half Marathon BABY!!!! The tape measure does not lie, and this photo is not doctored. I seriously do not recall ever reaching a whopping 44 inches in waist size! In fact, I even tried to rationalize it by saying to myself that my stylist was being generous when she took my measurements so that I would comfortably fit into my TwirlyBoy costume. I realize now that I was in denial all along! All my pants had elastic in them, so even though they read "38" on the label, they actually stretched a few more inches! The fact that I never wore jeans during this time just confirmed it. DAMN! I had a 44 inch waist!! By the way, for those who do not know, I starred is a short film called "TwirlyBoy." 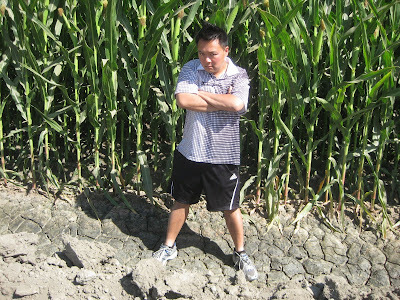 I am the "Chief Instigator" of It Donned On Me, a competitive film making team located in the San Francisco Bay Area. We compete in timed film competitions such as the 48 Hour Film Project, The International Documentary Challenge, and the Seven Day Film Challenge. For our 2008 San Jose 48 Hour Film Project entry, I stepped out of the role of executive producer and into the lime light! Check me out in all my rotund glory! Just ran 3.5 miles at 11:01 during lunch. 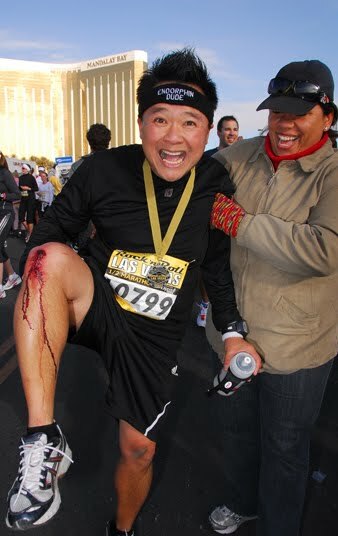 Only 11 days until the San Jose Rock & Roll Half Marathon, Baby!!!!!!!!! 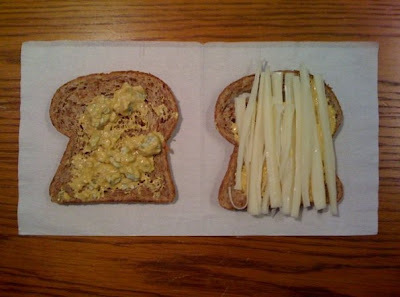 Breakfast: low fat mozzarella and blue cheese crumbs in a mustard aoli sauce on two sprouted flourless whole wheat berry bread. 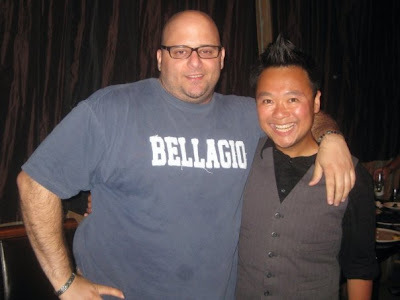 Meet Jeff Crispi. Mr. Crispi is one of the most colorful people I've met in a long time. 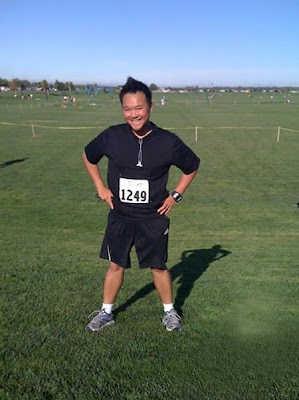 After my 10k, I left Modesto and headed to Walnut Creek to MC his 40th birthday bash. Thanks to the endorphins, I was able to make it through the evening without passing out. I could have ditched this party altogether, but I really wanted to be there. Jeff had something to do with my quest to get healthy. 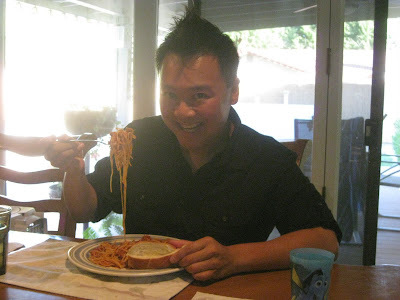 Jeff is a film maker and he is working on documentary called "Full Scale: The Divine Proportion." 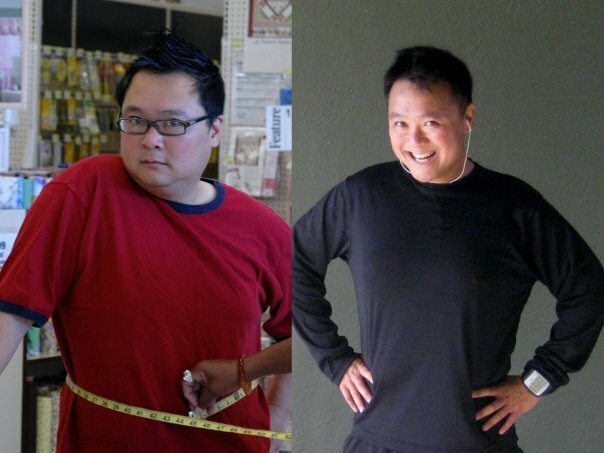 This film chronicles his quest to lose 100 pounds and to beat cancer. Jeff invited me to be a part of this project, and I happily accepted. I was supposed to just talk about my issues of weight, but somehow it turned into something more. After my interview, I started my walks. Next thing I knew, I got healthy. I have to give Jeff some credit for my transformation. Happy Birthday, Mr. Crispi. Lap 1, 8:05am - 8.21 per mile.I didn't speed out of the gate this time around! I learned from my mistake two weeks ago in Ripon, so I made sure I paced myself. Lap 2, 8:13am - 9.17 per mile. I remember thinking to myself, "Damn, my iPod is on shuffle mode!" I had no idea what song was going to come up next. I don't think this was a good thing because my rhythm was thrown off. I was feeling confident by mile three. When I hit the halfway point, I saw Wickpharm at the water station. I gave him a high 5. Lap 4, 8:32am - 10.02 per mile. By mile four, I was telling myself that I should slow down and walk. Then my mind would tell me, "uh, why would you do that? Your body is doing fine!" So I just kept going, and I was feeling good. Lap 5, 8:42am - 9.56 per mile. Lap 6, 8:52am - 10.02 per mile. My mind wandered off by mile six. My legs were getting tired, so my mind drifted off to Jeff Crispi's birthday party. Jeff is a film friend of mine and I was invited to be the master of ceremonies at his 40th birthday bash. By mile six, I was thinking about the jokes I was going to throw out during his roast. 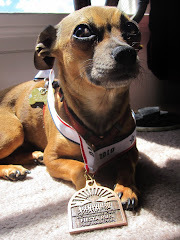 By the way, Jeff is a cancer survivor, and I ran in his honor. Lap 7 - The Finish Line. 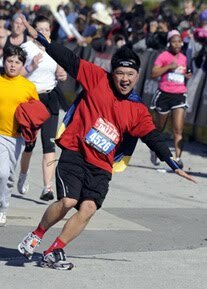 As I crossed the finish line, I couldn't help show how happy I was. It was the endorphins. I was on such a high. I shouted to all the spectators, "I DID IT! IT'S MY FIRST 10K EVER! I JUST LOST A HUGE CHUNK OF WEIGHT AND NO LONGER HAVE HIGH CHOLESTEROL!" I said so many silly things that I don't even really remember exactly what it was that I said, but you get the picture. 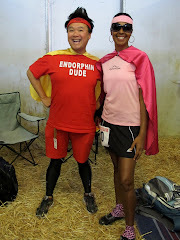 It was definitely an out of body experience, as Endorphin Dude took over! This is not good. I have a 10k scheduled for this weekend and I'm feeling dizziness, fatigue, and I am zapped of all energy. Where did this come from? NyQuil, please make this go away. Macbook Pro will now be closed so that Endorphin Dude can get some shut eye. Still experiencing runner's high from yesterday's 13.1 miler, so what do I do? 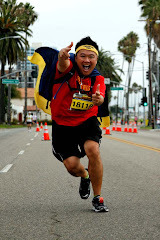 I registered for another half marathon! Is this too much too soon? I haven't even run my first official marathon yet, and now I'm adding another one just one month later! Right now, I am motivated and confident. This weekend's run made me realize that I can do this. 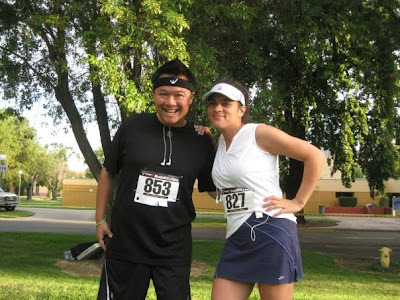 The Eye-Q Two Cities Half Marathon will take place in Fresno on November 8, 2009, and I've convinced my brother-in-law to run it with me. My sister will probably be walking the half with my niece Maddie. It will be a family affair! Oo-Wee! 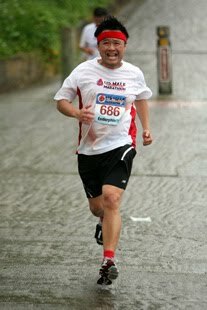 I just ran the equivalent of a half marathon! 13.1 miles at 11:12, and I did it in 2 hours and 26 minutes! My legs feel like mashed potatoes but I'm feeling good. 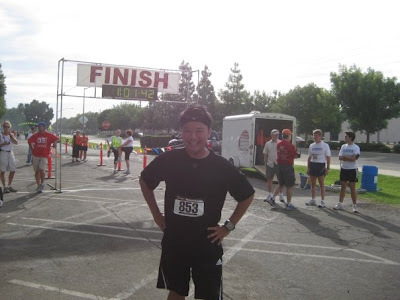 I am so ready for the San Jose Rock & Roll Half Marathon. 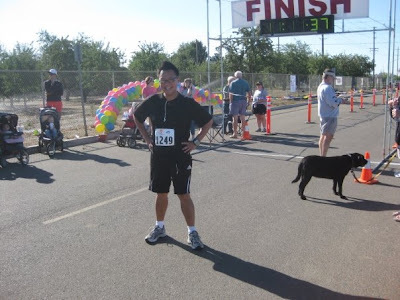 Right after the Color The Skies 5k, I left Modesto and zoomed off to SFO to pick up my cousin Freddy from Minnesota. 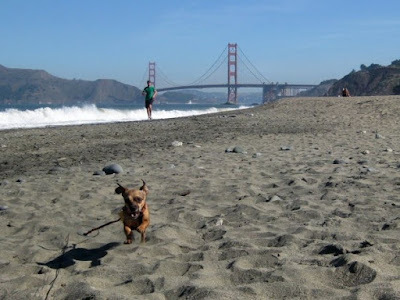 Cousin Freddy spent every summer in California when we were kids, so his visit to San Francisco is like a mini reunion, only this time we won't be spending hundreds of dollars at the San Mateo County Fair trying to win an action figure that oozed out slime. That, by the way, is an embarrassingly true story. 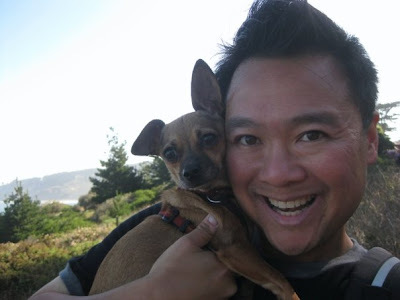 Cousin Freddy and will stay in San Francisco for one night and then it's the road trip to Sin City! So instead of dropping $1 bills at the fair, we'll be dropping $20 bets on the roulette tables. My, how times have changed. 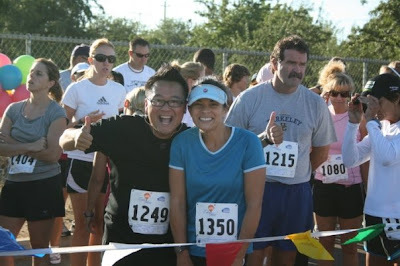 Truth be told, I was extremely nervous about this 5k. Can you blame me? This was my very first race ever. I remember having butterflies and bats doing combat in my stomach the night before. The only thing that kept me from going too crazy was knowing the fact that I had a partner in crime running with me: Mrs. Wickersham, my trainer and marathon mentor's wife. Having her really calmed my nerves. Lap 1, 8:13am - 8:08 Per Mile. I made a rookie mistake. I shot out of the gate and ran as if I was being chased by the school bully after humiliating him by slipping a whoopee cushion on his seat in the cafeteria. I ran with the elite at and 8:08 pace. The adrenaline got the better of me, and I was flying high. However, I was knocked back down to reality once I got to mile #2. Lap 2, 8:21am - 10:07 Per Mile. Ugh. All I wanted to do was stop and lay down on the dirt ground. I lost all breath, but rather than coming to a complete stop, I slowed down as quickly as I could to recover. At one point, I walked for about two-tenths of a mile. I needed to do everything humanly possible to regain my breath and recover. 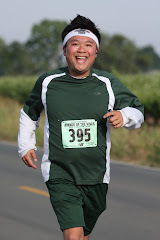 When I reached the water station at the halfway point, I scooped up a paper cup and attempted to drink. Unfortunately, everything went up my nose. Rookie mistake #2. I later learned that you're supposed to pinch one side of the paper cup to create a small opening. I'll remember to do this at the next race, as I do not want to drown again! Lap 3, 8:31am - 9:49 Per Mile. Luckily, I was able to recover. 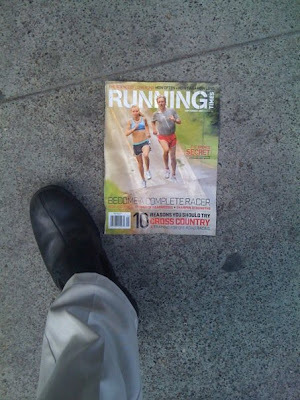 For the last mile, I kept a steady pace. Lap 4, The Finish Line. 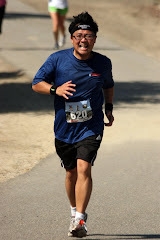 With only a tenth of a mile left, I sprinted all the way to the finish line. I really wanted to finish under 30 minutes, and I did! AH! Victory! Mrs. Wickersham crossed the finish line a few seconds later. Ah, pack on the spaghetti! Give me all the energy that I need for my first 5k! I love it, I can indulge in all the carbs I want without any guilt. Here I am in the Wickersham dining room the night before the Color The Skies. Rise. Shine. Give. Run. 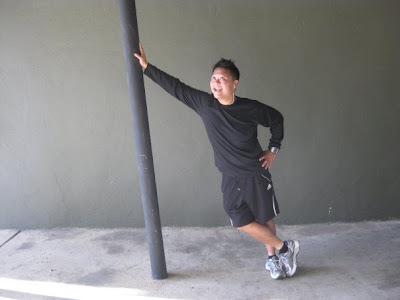 Since I've never ran a race before, I don't really know what to expect, so I'm just doing what my trainer tells me. If Dr. Wickersham says to shave my head and drink orange flavored Gatorade from my shoe, I'd probably do it. That's how green I am. In any case, I am really looking forward to this race. Should be fun.